Caution: black water rafting is not for the faint of heart. I know what you’re probably thinking…black water rafting? Isn’t it called white water rafting? Well, not if you’re in a cave 300 meters below the ground. Black water rafting (also known as cave tubing) is a popular activity at Cave World in Waitomo, New Zealand. 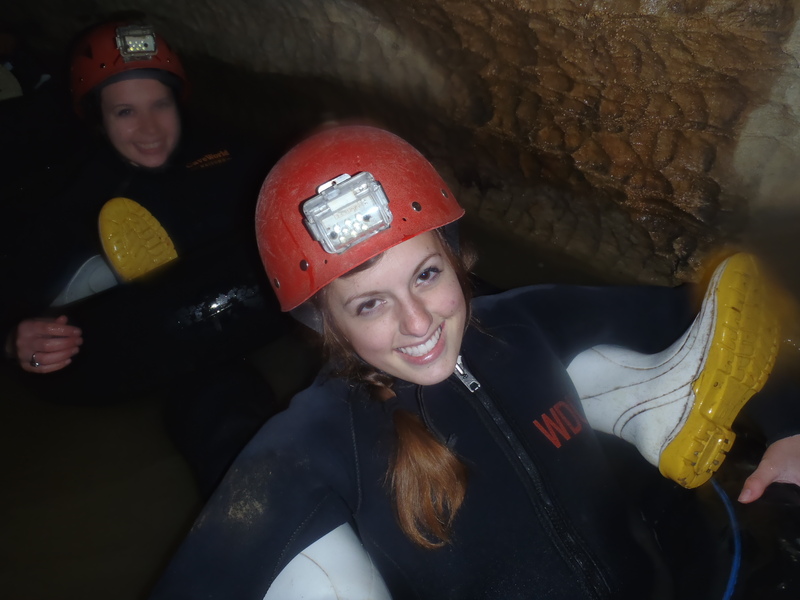 Naturally, Kim and I decided to give it a go, despite the estimated 10 degree Celsius temperature of the cave water. Our guide leaders hooked us up with a wet suit, jacket, helmet, and gumboots for the trek and loaded us up into a truck to take us to Waitomo Cave. When we neared the cave entrance, we picked up inflatable inner tubes and felt the air around us getting colder as we descended. We started the journey by walking through the caves to admire the glowworms’ dazzling galaxy. The scene looked like a dark sky filled with tiny green lanterns glowing brilliantly. Not as cute when you find out the “beautiful glow” comes from glowworm poop. Fun fact: glowworms can only be found in Australia and New Zealand. When we waded deeper into the water we got situated in our tubes. Our whole group was linked together by putting our legs on the tube of the person in front of us to connect together. Now, we thought this journey would be comparable to a lazy river ride or wave pool, letting the current carry us gently through the caves. This was definitely not the case. Once we came up to the first waterfall, these thoughts were quickly dismissed. Our guide instructed us to hold our breaths, close our mouths, close our eyes, and hope for the best. Then we jumped backwards off the ledge with our inner tubes under us. This was one of the most terrifying parts of the experience because we thought we were done with jumping off of ledges yesterday. 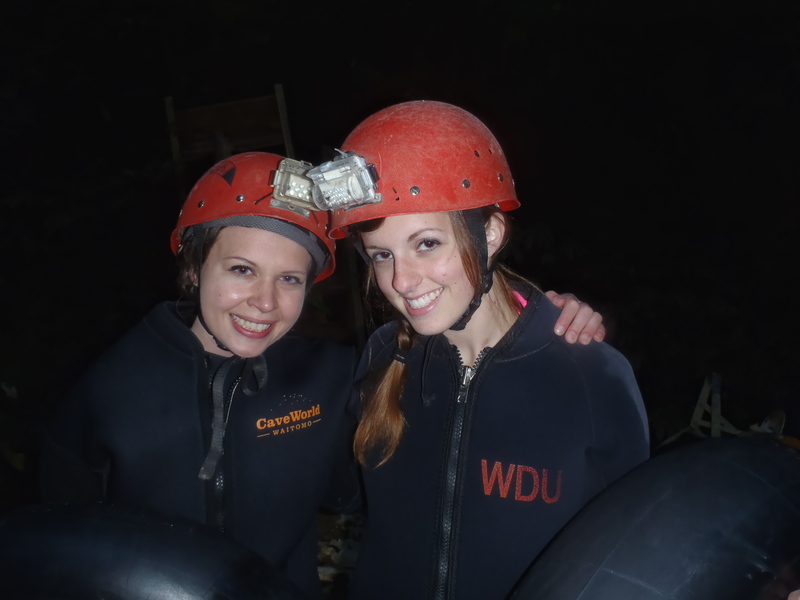 Next, we had to individually swim through a dark passageway barely big enough to fit our inner tubes through. The second unexpected moment was the hydro cave slide. I’ll admit, it’s a bit frightening speeding down a slide into a black abyss. Our next feat was to lead the pack of cave crazies on a trail lined with ropes to hang on to. This path led us to the end of the cave, and about 300 steps later, we emerged back into the real world feeling accomplished, yet physically exhausted. When we returned to the site, we were treated with hot showers and hot chocolates, which were much needed after the frigid two hours spent in the cave. So if extreme adventures are your fav, go ahead and brave the cave! Posted on June 27, 2011, in Destinations, New Zealand and tagged Adventure, backpacking, black water rafting, cave tubing, Cave World, Coley Nelson, glow worms, Kim Pitingolo, Magic Bus NZ, new zealand, Travel, waitomo. Bookmark the permalink. Leave a comment.